Notes: Ankara Castle (Turkish: Ankara Kalesi) is a fortification from ancient or medieval era in Ankara, Turkey. The exact date of its construction is unknown. Having been controlled by Romans and Byzantines earlier; it was captured by Seljuq Turks in 1073, by Crusaders in 1101, who gave it back again to the Byzantine and again by Seljuqs in 1227. The castle saw extensive repair by the order of Ibrahim Pasa in 1832 during the Ottoman era. 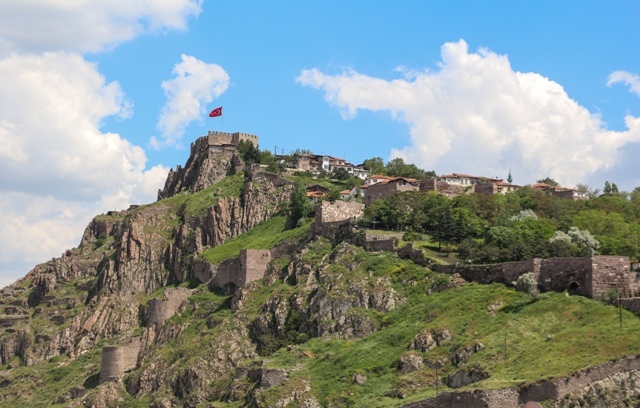 The outer citadel surrounds the old Ankara. There are 42 pentagonal towers along the walls, which range between 14�16 m (46�52 ft) in height. The inner castle covers around 43 km2 (17 sq mi). : Its southern and western walls intersect in a right angle, the eastern walls follow the ledges of the hill and the northern side was protected with a different type of defensive walls. Tr_Tr23.